PROPERTY DESCRIPTION: SOUTH-EASTERN side of the island. Water front plot of land 360.000m2 with big coast line, sandy beaches. Forestry certificate. Complete file. PROPERTY DESCRIPTION: ANO APROBATOU, western side of the island. 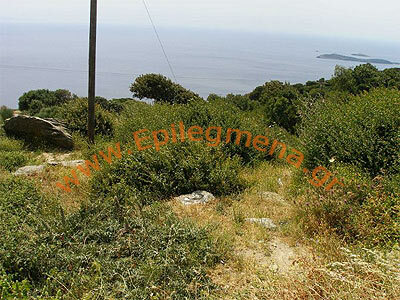 Plot of land 1817m2. in the village settlement; To build 400m2 residence + auxiliary areas. 90m face on the provincial road. Unlimited sea views, splendid sunset. Ideal for 4 residences. There are three main areas to stay in Andros with several smaller villages to choose from as well. Batsi is the island's main resort and on the sea. Andros Town is on a narrow peninsula on the east coast and is quite striking. Gavrio is the port and quietest vacation spot. The island of Andros has long been a favorite spot for wealthy Greek shipping magnates who breed horses on their private estates. It's also a popular destination for package tours. Most tourists enjoy patronizing its trendy bars, discos and fashionable boutiques. Both Nimborio and Paraporti Bays at Hora are suitable for swimming as is Gavrio's beach. Batsi has the nicest beach but Koritho on the islands SE tip and Vitali in the NW are pleasant too. The red soil of the bare northern part of the island give it a reddish-brown glow at sunset. You may see long-haired goats and eagles there, too. The farmers divided their plots of land with carefully built stone walls. The walls are unique because of triangular slates which were built into the designs. This island's capitol is Andros Town (Chora) with a population of over 9,000. Andros has pristine white houses, archways and churches. At Mesa Kastro, on a tiny peninsula just outside Andros Town, parts of the Venetian ramparts, towers and bridges can still be seen. Andros Town owes its wealth to shipping. The neo-classical mansions which line the narrow spit of land upon which it rests testify to this rich heritage. Between the two world wars Andrians owned fully one-fifth of all Greek merchant ships. What's different about Andros is the rare sense of public spiritedness these wealthy inhabitants possessed. You can see evidence of this around Andros Town. The statue of the Unknown Sailor who guards the ruins of the Venetian Castle in Platea Riva. Close by is the stone arch which is all that remains of the bridge to the Castle Mesa Kastro, which was damaged in WWII by bombs. In Andros Town, there is a small maritime museum representing Andros involvement in shipping. There's an archaeological museum with finds from all eras and art by the sculptor Tobros. The Archeology Museum (open Tues-Sun, 8:30-3, fee) houses the Hermes Psychomorphos or Conductor of the Dead. On the way back to the center of town from the Mesa Kastro is Panagia Theoskepasti, a chuch dedicated to the Virgin Mary. The roof for the church was delivered under miraculous circumstances involving prayers to the Virgin and a convenient storm at sea which was calmed in answer to the prayers. The church is therefore known as Theoskepasti, meaning sheltered by God. The Riva District, where many mansions may be seen, and Andros' central square called Platea Kairis have steps leading down to Kato Kastro, the labyrinth of streets that form the medieval city. These are wedged between the two Bays of Paraporti and Emborios where sandy but windy beaches, bungalows and pensions exist. Just to the north of Platea Karis is the Archeology Museum. You'll find a Modern Art Museum in Andros Town, just north of the main square. There are modern scultptures by Greek artists such as Tombros, Bouzianis and Manolidis as well as international artists such as Braque. Entrance is free. The Museum of Modern Art was endowed by the Goulandris Family Foundation (open Wed-Mon, 10-2 & 6-9, T:22490). In the center of town are the banks, OTE (telephone) and post offices and the main street is a marble-paved people-only walkway over which wafts the smells of local bakery and pastry shops. The bus station is also nearby. On one end of Emborios harbor, Aghia Thalassini Church guards the entrance. And in town the Cathedral Aghios Georgos is built on the ruins of a 17th Century church. South of Hora the villages of Lamyra, Strapouries and Ypsila are picturesque with well tended gardens and hospitable good character. Nearby Menites, is among the loveliest villages on the island and boasts the remains of a ruined tower and its Church of the Madonna of Koumoulos. A bit further on the cultural center of the island during the 18th and 19th century was Mesaria with its Kairis family tower and the Church of the Taxiarchs built circa 1143 AD. Still further South the Monastery of Panachrantos was founded in 961 at Fallika after the liberation of Crete. More to the southeast of Andros Town is the village of Livadia, which has a Frankish church. In the mountains 12km southwest of Andros Town is the spectacular monastery Moni Panachrantou (open daily). It a steep walk from either Mesaria or Andros Town to this monastery overlooking the valley. Founded in 961, the Byzantine style building today houses just three monks. There are many treasures in the church, including the skull of Agios Panteleimon, which is believed to have healing powers. This holy relic is brings flocks of visitors to the monastery on the saint's annual festival day. To the northeast of Andreos Town in Apoikia are the Sariza Therapeutic Springs. You can taste the waters at the spring. North of the spring is the 18th century Monastery of St. Nikolaos. Stenies is another attractive village to the north of Apoikia and has handsome houses belonging to sea captains and sailors. 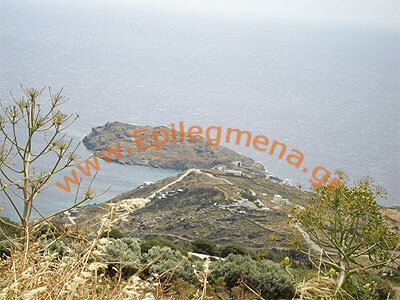 Head southwest of Andros Town for 18km to find the rocky plateau and the ruined Venetian Palaiokastro. It was built between 1207 and 1233 and is called the Castle of the Old Woman. The name arose after a woman betrayed the Venetians to the Turks in the 16th Century by tricking her way into the castle and opening the gates for the Turks. She was appalled by the bloody massacre that resulted and leaped off a cliff in remorse. The rock from which she jumped is Tis Grias to Pidima, or Old Lady's Leap. The famous rock is near Korthio. Gavrion (or Gavrio), where all ferries dock, on the NW corner of the island is 34 km from Andros Town. Long a windblown little port, it is seeing better times with the addition of new paving stones, flower beds and other public works. Gavrion is in the process of turning its beach, rooms, pensions, bars and restaurants into an alternative during high season, when most of the rest of the island is fully booked. Gavrion is the main port, the ferry quay, and is located on the northwest coast. It's a 40 minute walk up to the Pyrgos Ag. Petros, the best preserved monument on Andros. The tower stands 70 feet high, with an inner wall still bearing a corbelled dome. The tower may have been a watchtower, but its actual purpose is lost to history. The upper reaches of the tower were reached by footholds and an internal ladder. Even further North another medieval garrison tower is preserved at Makrotalanto. And North of that the villages of Kalyvari and Varidi are overlooked by the remains of Fortress Vrikokastro. Upper and Lower Felos Villages have two notable churches; The Church of the Transfiguration and Aghios Haralambos. There are good beaches north of Gavrion at Fellos beach and beyond the nearby village of Verasmia. Built around a wide bay Batsi has a little fishing harbor and small village with many labyrinthine streets. Batsi is 6km south of the port at Gavrion. A tranquil setting unusual for the rugged Andros distinguishes Batsi. A family-style resort, the beach at Batsi fills up quite quickly during season. Those requiring less in the way of bathing accoutrements head down the coast a bit to Delavoyas Beach. A path ascends fro Batsi to the garden-like village of Arnas on the slopes of Andros highest peak Mt. Petalos (994m). Ancient Palaiopolis was the original ancient capital of Andros and lies 10 km down the coast from Batsi. It was destroyed by earthquake. Its partially submerged ruins may be seen including its walls, parts of the acropolis and buildings and temples. A steep path of 1040 steps leads up to modern Palaiopolis and the road continues on to Hora through a rolling landscape interspersed with dovecotes and the remains of Venetian and Byzantine habitations. Dovecotes dot the entire island, and are one of interesting features of Andros. They were first built by the Venetians. There are good eateries in Andros Town, Gavrion, Batsi, Apikia, and Kothion. At night you can find bars and discos running full steam ahead. Inhabited first by the Ionians in 1000 BC, Andros has been populated ever since. In the 5th Century BC, Andros sided with Sparta during the Peloponnesian War. The Venetians ruled it later, and the Turks took power in 1522, ruling until the War of Independence. In modern times, Andros has become the holiday haunt of wealthy Athenian families. Book in advance during high season! Be aware that the beaches can sometimes be windy. The island's inhabitants seem to prefer guests to stay for an extended period of about 2 weeks rather than just one or two nights. We can find you the accomodations you need, however, so don't worry about a thing. By Ferry: Daily to Rafina, Mykonos, Tinos.